Nicky Jam and Enrique Iglesias took home seven awards apiece, including six shared awards for their hit duet "El Perdon," at the Billboard Latin Music Awards in Miami. The duet topped an entire night of special pairings and collaborations among Latin artists at BankUnited Center at the University of Miami in Florida, which aired live Thursday on Telemundo. 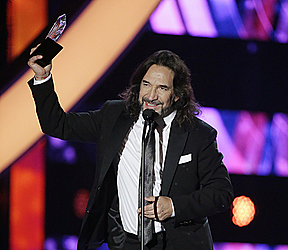 "El Perdon" earned awards for being the top song in airplay, digital downloads and streaming. Juan Gabriel won six awards, including the Billboard Spirit of Hope Award, and sang with Paty Cantu. Romeo Santos won five awards, including artist of the year. Daddy Yankee and Don Omar, who were honored with the Industry Leader Award, performed on the show, while Marco Antonio Solis sang with Natalia Jimenez and Marc Anthony.